Trained in Slovenian law, yet Rok Zlender felt something was missing. For 27 years he grew up in a basically secular milieu, especially among his friends in his native Slovenia. But his faith was nourished in a Franciscan parish where he even served on the parish council. At first, he explored the possibilities of joining the Franciscans but was not sure that was for him. At 25 26 he met a Vincentian and began to make connections with his middle name of Vincent. A Daughter of Charity was helpful in further introducing him to St. Vincent. Now he had to look more closely at what seemed a mysterious call. Haunted by the question “Is God calling me” he felt “I had to give it a try even if only for a week or a month.” He discovered he felt at home. When it came time for the period of formation called the internal seminary or novitiate he was asked to come to the US to join 5 others with diverse International backgrounds. The first few months were difficult with so many adjustments of language and culture, both secular and religious. The group is currently at the halfway point of their program. At this juncture, they were sent “on mission” for five weeks to experience some form of Vincentian Apostolate. For Rok it was a bit shorter since he had to return briefly to his native country for visa purposes. As he came into contact with so many materially poor people he realized his image, and that of most visitors to America, was incomplete. He spent most of his time working in the Bread and Life Soup Kitchen associated with our parish. There he saw hunger in the faces of those for whom the mobile soup kitchen provided the only meal of the day. Most importantly this experience reinforced in him the importance for a Vincentian of daily contact with those who live on the margins. Living with other candidates from Ethiopia, Sri Lanka by way of Austria, Latin America and different parts of the United States has given him a greater appreciation of the internationality of the Congregation and different cultural approaches. The Eastern Province is blessed to have a man like Rok entrusted to our care. The second video of this series takes us to the small church of Folleville. Father Tomaž Mavrič recalls to us Saint Vincent entering that place to encounter a reality of spiritual poverty. Today, after 400 years, we see that the charism inherited from Saint Vincent remains current and challenging in the Vincentian Family’s dedication to evangelization. And here we are, after 400 years, called to go to Folleville again, to our own Folleville. Vincent was not really enthusiastic, at the beginning, really joyful, but did go at the end, passing through different obstacles to get the experience that was a gift from heaven. And we are now called to go through obstacles, not to be stopped, not for long roads, not for bad weather, snow, rain, or any other obstacles that we can find on the road. We are called to get to our own Folleville. Folleville is waiting for us. It is waiting for us in so many parts of the world, in cities, villages: small, medium-size, big. In all the continents, there are Follevilles: the experience of spiritual poverty that Vincent experienced in Folleville so much, now in today’s world, as well, in all the continents. The second video in this series takes us to the small church in Folleville. Father Tomaž Mavrič recalls Vincent’s entrance into that place where he encountered the reality of spiritual/material poverty. Today, 400 years later, we see that the charism, inherited from Saint Vincent, remains relevant and challenging as the members of the Vincentian Family engage in the process of evangelizing those persons who are poor. The presence of a city priest, as Vincent was seen, did not go unnoticed. A peasant, who lay terminally ill in a nearby farmhouse, sent for this new priest. In 1658, Vincent spoke about those events and stated: Would you call the origin of our missions human? One day I was called to hear the confession of a poor man who was seriously ill. He had the reputation of being the most upright of men — or at least one of the most upright men — of his village. Yet, he was burdened with sins he had never dared to confess, as he himself afterward declared aloud in the presence of the late wife of the General of the Galleys. “Madame,” he said, “I would have been damned had I not made a general confession, because of the serious sins I had never dared to confess.” The man died shortly afterward and the said Lady, realizing the necessity of general confessions, wanted me to preach a sermon on this subject the next day (CCD:XII:7). From the reaction of this poor country man, we gain insight into Vincent’s attitude. In Vincent’s presence, the man lowered his guard and as a result, the man was saved (but Vincent was also saved). As Vincent listened to the confession of this person, he became aware of this man’s spiritual poverty … a poverty that was widespread throughout Europe during that era. Folleville marked the beginning of an adventure that has touched the hearts of countless men and women. As people read the signs of the time, they are very aware of the fact that such poverty is a reality in the twenty-first century and therefore, we, as members of the Vincentian Family, must continue to proclaim the Good News. CCD:XII:7 refers to Vincent de Paul, Correspondence, Conference, Documents, translators: Helen Marie Law, DC (Vol. 1), Marie Poole, DC (Vol. 1-13b), James King, CM (Vol. 1-2), Francis Germovnik, CM (Vol. 1-8, 13a-13b [Latin]), Esther Cavanagh, DC (Vol. 2), Ann Mary Dougherty, DC (Vol. 12); Evelyne Franc, DC (Vol. 13a-13b), Thomas Davitt, CM (Vol. 13a-13b [Latin]), Glennon E. Figge, CM (Vol. 13a-13b [Latin]), John G. Nugent, CM (Vol. 13a-13b [Latin]), Andrew Spellman, CM (Vol. 13a-13b [Latin]); edited: Jacqueline Kilar, DC (Vol. 1-2), Marie Poole, DC (Vol. 2-13b), Julia Denton, DC [editor-in-chief] (Vol. 3-10, 13a-13b), Paule Freeburg, DC (Vol. 3), Mirian Hamway, DC (Vol. 3), Elinor Hartman, DC (Vol. 4-10, 13a-13b), Ellen Van Zandt, DC (Vol. 9-13b), Ann Mary Dougherty (Vol. 11-12); annotated: John W. Carven, CM (Vol. 1-13b); New City Press, Brooklyn and Hyde Park, 1985-2009. Jim Dorr has been hospitalized in South Buffalo General and will be there at least overnight under observation for a possible heart attack. These past couple of days we may have noticed him complaining of pain in his arm to which he had been attributed to either arthritis or “unexplained causes.” Well, today, while he was at Wegmans in Buffalo (as you know he is home w/ his family to bury his niece’s husband), he went to the Pharmacy and explained his condition. The staff immediately called 911 and had him transported to the hospital where he has been undergoing tests. JIm has yet to get a stress test and an echocardiogram. His family and friends already have been very attentive to him. One of his friend’s went and move his car from the Wegman’s lot to his niece’s house. I spoke with him recently and, as always, Jim is in great spirits, but realizes, unfortunately, he cannot celebrate the funeral tomorrow. He hopes, yet, to be back on Saturday and present to his parish at the track. I assured him of our prayers and thoughts for a speedy recovery. The Vincentian Solidarity Office welcomes Fr. Gregory Semeniuk. We are happy to share the news that Fr. Gregory Semeniuk, C.M. has been appointed as the new Executive Director of the VSO. Fr. Gregory is from the Eastern USA Province. Before coming to the VSO, he was serving as Vicar for Multicultural Ministries at the Archdiocese of Philadelphia. (Fr. Gregory speaks four languages.) Earlier in his priesthood and for ten years, he served in Hispanic Ministry in New York. Fr. Semeniuk also previously taught theology in the major seminary of the Archdiocese of Los Angeles. Fr. Gregory resides at the Theologate house of the Eastern Province, where he also serves as a part-time formator. Five years ago this month, our Congregation started a mission in Angola. Getting the mission established has been a challenge. Angola is a troubled place. It only recently gained its independence in 1975. A 25-year civil war quickly followed, killing up to 1.5 million residents anddisplacing 4 million others. Like other African nations, Angola has lots of oil—a resource that promised socioeconomic development, but instead has led to great economic inequality, corruption, and lost opportunity for human progress. Our mission in Angola is located in the town of Lombe, outside the city of Malange. The mission serves 40 communities, some as far as 40 kilometers away from the mission center. The VSO first assisted the mission by sending monies for our confreres there to purchase a vehicle to traverse the challenging roads. Recently, the VSO provided funding to help our confreres in Angola start a large vegetable garden and orchard, and build a wall to protect them from animals. For some years, our confreres in Nigeria have operated St. Joseph’s Primary School and De Paul Secondary School in Oraifite, Nigeria. These are special schools because they serve children who are deaf or have severe hearing impairments. Such children lack adequate access to schooling in Nigeria. But these two schools are also special in another way; they teach students with full hearing in classrooms alongside children who cannot hear. Such “inclusive” education is also uncommon in Nigeria. The VSO assisted our Province of Nigeria in obtaining grant monies from Kindermissionswerk and the Diocese of Rottenburg-Stuttgart, which it matched with monies from the Vincentian Solidarity Fund, to pay for the construction of the ground floor of the new hostel. At this time 99 students, including those with and without hearing, live together in the hostel. The VSO is now working to finance the construction a second floor to house more of the students. What is the Vincentian Solidarity Office? To assist the Congregation of the Mission with obtaining funds for its evangelization and service of the poor. We can learn a lot about our new Provincial, Father Stephen M. Grozio, CM by walking with him on his journey to today. Father Stephen M. Grozio, CM is a member of the Eastern Province of Congregation of the Mission, and a graduate of Niagara University. He was ordained in 1978 and in his first assignment he taught religion and mathematics at Archbishop Wood High School in Warminster, Pennsylvania. In 1981 Fr. Grozio was chosen to do migrant ministry in the Diocese of Kalamazoo, Michigan. This was a missionary work very close to the heart and spirit of St. Vincent de Paul. After learning Spanish, “Padre Esteban”, as he was called, served the Spanish-speaking farmworkers and residents of the diocese and even became a “migrating priest”, accompanying the farmworkers to their towns and villages in Texas, Florida, and Mexico. The words of our Savior, “Whatever you do for the least of these, you do for me,” took on new meaning as he journeyed with these hard working immigrants and attended to their spiritual needs. A change was in store for Fr. Grozio in 1989. Though he had volunteered for the missions in Panama, he was sent instead to St. John the Baptist Parish, a financially struggling, but spiritually alive parish in the Bedford-Stuyvesant section of Brooklyn, New York. There he served as an associate pastor for two years and as pastor for four more. Life in the inner city was quite different from that in the country. Farm labor camps were replaced by tenements, tomato fields by traffic, and blueberry bushes by “brownstone houses”. Urban poverty was different and perhaps even more devastating than the economic poverty of the farmworkers. People needed hope, even more than help. Sitting and talking with the men and families in the soup kitchen was just as important as serving them food and providing them with basic medical care. Father’s six years in Brooklyn were interrupted by a five-year appointment as Assistant Provincial. Though he had to pull back from hands-on ministry to the poor, he was able to provide support and assistance to the other Vincentian priests and brothers of his province. During this time he was able to travel to Panama several times as a translator for the Provincial and witnessed the work being done by lay and religious members of the Vincentian family there. In 2000 Fr. Grozio was named the director of the Hispanic Evangelization Team which served the Spanish-speaking communities of five parishes in the Archdiocese of Philadelphia. He was also named the Provincial Treasurer of the Eastern Province in 2002, in effect splitting his time between the spiritual needs of the immigrant poor and the financial management which enables the Vincentians to serve them competently. Since 2007, Fr. Steve has been the director of the Hispanic Apostolate of the South Fork of Long Island, which offers Catholic Mass, sacraments and other services in Spanish in seven parishes on the east end of Long Island. He, Fr. Jesus Arellano, CM, Fr. Cesar Lara, C.M. and Sr. Margaret Smyth, OP on the North Fork serve immigrants from Ecuador, Mexico, Costa Rica, Guatemala, Colombia, El Salvador, and Paraguay, among other countries. With this quick review of what he has done you can see the wealth of experience he brings to his new ministry. CMEAST hopes to bring you “Part B” of “Getting to know our new Provincial.” He is understandably in the midst of his own personal transition as well as finding his replacement in his ministry on the South Fork of Long Island. As soon as we can we will share with you an interview as he begins he new ministry. 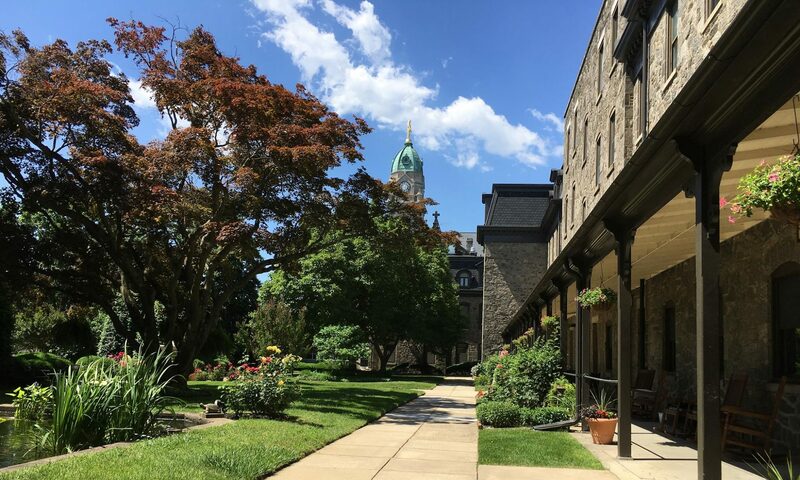 Tracy L. Barnett, writing for the Global Sisters Report, offers insight into the work done by an Eastern Province confrere and a Sister of Mercy who is the blood sister of another Eastern Province confrere. At its peak in 2011, and again in 2012, the battle to stop the dam effectively shut down commerce in the western part of the country, as thousands of Ngäbe protestors and their allies blocked the Pan-American Highway. Mercy Sr. Edia López was among them. As was Fr. Joe Fitzgerald. “I came into the area just to ask for a service job as a missionary with the poorest population of the country, without realizing that they were facing a very big problem with land and water,” said López, known as “Hermana Tita” throughout Chiriquí province. A native of Chiriquí, she has been working in the comarca since 2010, when she moved from another district near the Costa Rica border. A small, animated woman with an easy laugh and a quick wit, she has witnessed the severe police repression that has occurred. She was moved to tears as she recalled seeing several indigenous activists injured in clashes. In the beginning, the fights against the mining and against the hydroelectric dams were linked, she said. The movement won a victory with a law to stop international investment in the mining industry in 2011 and with a new law to prohibit mining in the comarca in 2012. But a growing number of hydroelectric dams were still underway, including Barro Blanco, and the fight went on. “I honestly didn’t know what to do, but there we were in the streets, in the protests, and in meetings with the leaders, the coordinators, the grassroots leaders,” López said. She found herself helping with logistics, with mediation with government leaders and police — roles that were beyond anything she’d imagined, but it was what needed to be done, and so she did it. Bulu and his wife, Adelaida González, stood in the mud and recalled that terrible night last August when they awoke to find the waters of their sacred Tabasará River seeping into their home. They scrambled to collect their children and as many of their possessions as possible. Neighbors weren’t so lucky; their houses were completely washed downstream. A child narrowly escaped drowning in those harrowing hours. They had been given no warning, he said, and since negotiations with the government and dam builder were ongoing, the family had thought they were safe. The affected communities of Kiad, Nuevo Palomar, Quebrada de Caña and Quebrada de Plata weren’t consulted about the flooding of their lands, they say, which directly affects around 500 people but also has an important impact on the entire Ngäbe-Buglé Comarca, an autonomous territory that is home to more than 150,000 individuals of the Ngäbe and Buglé indigenous groups. The Tabasará River in itself is sacred for them, as is the ceremonial site that is now submerged. Despite the years of fierce resistance, the dam was built downstream, and last May the reservoir began to fill. Now the residents of the flooded communities are just asking that the water level be brought down to the boundary of their territory, consistent with the law. Kiad is an important cultural and ceremonial center for the Ngäbe; there along the river lay two sets of ancient petroglyphs that contain the clues to the wisdom of their ancestors. The boulders are now completely submerged, cutting off their connection to their past. The Honduras-based company Genisa said it was conducting a “test flooding” of an area that, according to its environmental impact statement, was uninhabited. Just another deception, opponents claim, in a long line of them, including carbon-credit certification under the Clean Development Mechanism (CDM), a program designed under the Kyoto Protocols to allow industrialized countries to “offset” their greenhouse gas emissions by supporting sustainable development projects in less-developed countries. International human rights and environmental groups have maintained that Barro Blanco was anything but sustainable, and that the history of human rights violations associated with the dam project should make it ineligible. Finally, the Panamanian government withdrew the CDM registration last November — a first for the CDM program. “The tactics this company used were pretty much what all companies have used — falsifying studies, not doing interviews or doing them far from the affected communities,” said Fr. Joe Fitzgerald, a member of the Vincentian community of Soloy who has ministered to the Ngäbe people in the region for 12 years. The project was temporarily suspended in part for noncompliance with the environmental impact assessment, but the suspension was eventually withdrawn and the project continued. Genisa, contacted by telephone and Twitter, has not responded to requests for an interview. The statistics back up his comment. “For the past 15 years, St. John’s has been named by U.S. News and World Report as one of the top schools for campus ethnic diversity, reaching the No. 2 spot among national universities in 2015, and tying at No. 5 in 2016. Jamie Manson, frequent NCR contributor and herself a 1999 graduate, writes in a recent edition, “St. John’s University, diversity is the ‘timely application of a timeless value’”. St. John’s students come from New York City, and an additional 28 percent come from Long Island’s Nassau and Suffolk counties. Of these students, 42 percent are white, 14 percent are Asian, 13 percent are black/African-American and 13 percent are Hispanic/Latino. Decades ago, St. John’s was one of the first schools set up a multicultural advisory committee. Recently, the university identified a chief diversity officer and appointed a presidential committee on diversity and inclusion. After spending nearly four decades watching students cross the stage at commencement, Mangione said that what strikes him most is that today’s students are essentially the same as when he was an undergraduate at the St. John’s. St. Vincent would no doubt agree. This term will be for six years. At this time I also thank Bernie Tracey and Aidan Rooney for sharing their Vision for the Province and their willingness to participate in the election process. Let us pray for Steve and ask Our Lord to fill him with the Holy Spirit so that he may lead us with wisdom and vision as we move into the future together. V. Rev. Michael J. Carroll, C.M. If you wish to email your congratulations to Steve, click here. For most of the past decade he has been ministering with the Hispanic community on Long Island. Prior to that he spent 8 years traveling with migrants as part of the Vincentian Migrant Ministry program. He has previously served as Assitant Provincial from 1991-1995. Pope Francis today released his 2017 Message for World Youth Day, in anticipation for World Youth Day Panama 2019. Dear young people, God is also watching over you and calling you, and when God does so, he is looking at all the love you are able to offer. Like the young woman of Nazareth, you can improve the world and leave an imprint that makes a mark on history ? your history and that of many others. The Church and society need you. With your plans and with your courage, with your dreams and ideals, walls of stagnation fall and roads open up that lead us to a better, fairer, less cruel and more humane world. Have a good pilgrimage to World Youth Day 2019. No doubt our confreres in Panama will be very involved in this major world event. On the occasion of the 400th anniversary of the Vincentian charism, the Holy Father, through the Apostolic Penitentiary, has granted the whole Vincentian Family, a Plenary Indulgence (Confession, Communion, and Prayers for the Pope). Those will receive it who participate in the Eucharist or in some public or private prayer service (Our Father, profession of faith, invocation of the Blessed Virgin Mary and of St. Vincent).